One of the greatest things about being a beader or jewelry designer, is the ability to make choices that influence the world around us. Whether we’re focusing on special materials, working with other artists, making jewelry with a statement, or simply donating our designs to charitable causes, there are so many ways that beaders make a difference. 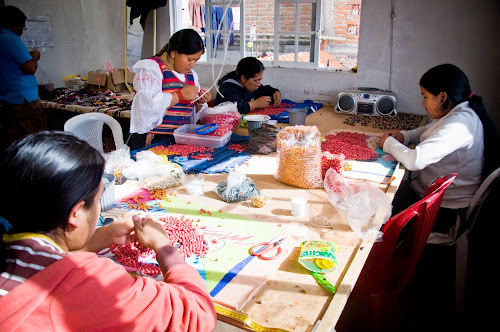 The fair trade jewelry line formerly known as the Andean Collection is one of my favorite bead related causes. Founded by Amanda Judge, this amazing little company made big changes to the lives of women and their families in South America. 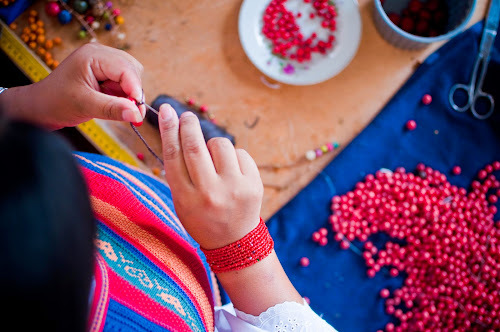 Now they are taking their efforts global by creating job opportunities for over 200 beaders and jewelry makers in Vietnam, Swaziland, and Ecuador with the Faire Collection. Faire Collection designs continue to amaze jewelry lovers with gorgeous natural materials like tagua, acai, and coconut. The incredibly trendy styles are bringing the message of the importance of fair trade products to boutiques around the world. Today’s Wear It Twice collage features handmade jewelry and accessories from the new Faire Collection. In addition to necklaces, bracelets and earrings, Faire artisans also make hats and scarves with flair. There are some amazing colors available, including bright tropical hues and subtle natural tones. I went with the always stunning combination of bright blue and rich brown, with just a hint of mint. The Geo-Stack earrings are my personal favorite. Also included: the Isabella Necklace, the chunky Classic Tagua Bracelet, Lola Hat with peacock feather, Rialto Earrings, and the Infinity Scarf. The natural shapes and patterns of the materials blend perfectly with the bright colors. If you haven't worked with natural beads like tagua before, they are a great way to add personality to jewelry. If you’d like to learn more about the project and the talented designers and artisan partners, visit ShopFaire.com. I am so excited about the project that I’m starting this week, which will be a reboot of a very old favorite. I’ve rediscovered the fact that it’s important to make things that you really love, instead of just focusing on what’s trendy, or easy to sell. Although I had already decided to stick with designs that I really enjoy - collars, lariats, and fringe necklaces to name a few - it didn’t occur to me that it would be perfectly alright to remake pieces from the past that I was really proud of, even if they weren’t big sellers. In addition to the new embroidery pendant, which is coming along nicely, I’m prepping the new project with lots of relish. I’ve got my custom bead mix already made, and my starfish bead colors on deck. All I need to do is finish culling some millefiori chips and it’s ready to go! Inspirations have been a little bit light of late, as I’m hip deep in my top secret project. Although I’m missing the time here on Inspirational Beading, I promise the results will be totally worth it! Today I took a little break to recharge my creative batteries, and what better way to do that than with some lovely beads? This soft and pretty collage was inspired by a set of absolutely gorgeous lampwork beads by Magdelana Ruiz of Mru Mru. I can’t resist a great spots-and-stripes motif in colorful glass! My bead tray looks a bit chaotic this week. I’m just getting started on two new projects and wrapping up another all at the same time, breaking my one project at a time rule and then some. Now that school is out for summer we have a lot more time to ourselves here, so we’re finally getting a new embroidery pendant underway. Since I do most of my beading at night while my helper is sleeping, the pendants are built slowly over several days, making them perfect for nights when a project is done, but it’s too late to start something new. I was told very matter-of-factly that we would be using one of my new hieroglyph tab beads in the new pendant, so that’s where we’ve started. I’ve also got a new full-project tutorial in the works, featuring some awesome neon seed beads and daggers from The Best Beads. The matte transparent finish is perfect for the neon colors. Like other transparent glass beads, they draw lots of light in, but the matte finish seems to hold it in place, giving the beads an intense electric glow. I was able to try out some of my new Miyuki fringe beads in a secret project earlier in the week - although I chose them for the color rather than the shape, so for now I’ve only seen what they can do as ordinary drops. I’m hoping to incorporate them more thoroughly into some flat or tubular beadwork, which I think they’ll be perfect for. Congratulations to the winner of this month’s bead giveaway, Judy, and thank you so much to everyone who entered. For this draw, I asked about how you would use a random mix of assorted broom beads (a mix made from spills and/or leftovers). As always, your answers were varied and inspiring. Do you like to use freeform peyote? What’s your favorite type of project? The found object and sea treasure appeal of beach glass is what made it a popular item for everything from knickknack bowls to jewelry, but those aren’t the only reasons why we love it. The warm glow of sand polished glass in soft colors is hard to resist for any magpie, which is why so many bead companies and artisans strive to recreate the look in a less rare - and sometimes more affordable - variety. With the spirit of beach glass in mind, I started this month’s bead palettes with not one, but two accent beads. I couldn’t bear to decide between the two colors, each with their own summery appeal. And after all, a single seed bead color can do a lot with the right accents and patterns. Today’s trios include Indonesian glass in gorgeous tropical lime green, and beachy frosted teal. Together they look like a mermaid’s treasure - all they need is a great background. I started with an obvious choice - the warm sandy color of transparent topaz really adds a beachy vibe. The slightly orange hue also contrasts perfectly with both the lime and teal, making for a very tasty trio. Grotto would look fabulous in a freeform piece, inspired by flotsam and jetsam on a hidden beach. Next I wanted to really enhance the sourness of the lime rondelles, and turned to an old favorite that looks right at home with rustic bead shapes. Turquoise blue white-hearts glow even brighter than warm tropical waters, and add a lot of light to the palette. Aloha would look gorgeous in a multi-strand piece inspired by gently lapping waves. Last but not least, I wanted to cool things down a bit with a much darker color. Black would have been much too easy, although the Java beads would look amazing on a stark neutral backdrop. Instead I went with the decidedly purple tones of cobalt iris. The shimmering finish is great for any aquatic inspired piece, and the violets and indigos play so nicely with the teal. Reef would be the perfect palette for a rope necklace or lariat with bead cluster focals. Do you like the look and mood of beach glass in your designs? Do you prefer the handmade or traditional style? It’s been a long time since we’ve had a good old de-stash giveaway, and this month I have some really great picks for you. Although I still have lots of great vintage acrylics to share, this time around it’s all new goodies. I recently received an adorable packet of broom beads as a freebie in my last bead order. I can’t resist a surprise bag of beads, even if there’s a chance that I won’t be able to use what’s in it. The unusual mixture that I found was actually really fun, with lots of colors and shapes to choose from, and plenty of multiples to make a successful project or two. Although I can tell right away that most of the pieces are glass, a few are a mystery. It could take me more than a year to find the right projects for most of these beads, so instead I’m going to pass them on to a beader who wants to tackle them. To sweeten the pot, I’m also including a few grams of 11/o Delicas in matte transparent gray and silver-lined ruby. For a chance to win all of the beads shown, simply leave a comment on this post telling us what you would do with the broom bead mix. I can’t wait to hear your ideas! One lucky reader will be drawn on Tuesday, June 17th. This giveaway is open to international readers. Today my bead tray is looking rather tidy as I’m just getting ready to start a new bracelet. I've chosen all the colors, and now it’s just a matter of getting the stitching done. I’m really excited to get started, as this will be the first piece featuring one of my new Czech glass buttons. I picked up the hematite finished one because I loved the pattern, but it was a little tricky finding the right palette to go with it. Without any other truly metallic beads in my stash - not counting the gold-tone freshwater pearls - I turned to brown iris. Like most of the Czech seed beads in the iris family, the finish gives them the look of a mix, rather than a single color. In this shade, about half of the beads look like a darker version of hematite. I've got some culling ahead of me, but it should work out nicely, especially with topaz to bring all the colors together. 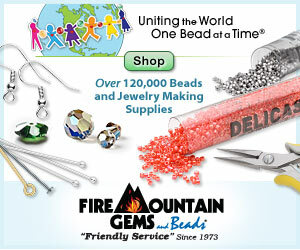 Do you suppose that it’s possible for one person to try every single bead available? It certainly wouldn’t hurt to try! Even though I’ve limited myself to only a handful of materials, I find it difficult just to keep up with my favorites. This month, I’m eyeing a few things in my stash that offer new twists on beads that I turn to often. First up is a gorgeous strand of striped green Java glass beads from Happy Mango Beads. The colors are so summery and tasty looking. This bead style is one of my all time favorites, not only because of the very classic looking stripes, but because they are so organic. The imperfect shapes give each design a lot of personality. I’m seeing these as fringe with some sassy colors and even more stripes. Transparent topaz has become one of my favorite colors for replacing gold in my Egyptian pieces. Dark topaz and light topaz both offer a great alternative with different moods, and I’ve been a fan of them for a couple of years now. And then I found medium topaz at Fire Mountain Gems. In any light, the color is gorgeous, and it has all the traits I look for in a not-gold bead. I’m just gonna use them in everything! I recently did a little stock-up at Artbeads.com and picked up a few colors of Miyuki fringe beads to try out. I’ve always loved daggers, drops, and magatamas, and these little beads are right at home in my stash. I haven’t had a chance to try them out yet, but I can’t wait to see what they can do. Unlike so many drop styles, the shape of these are a lot closer to perfectly round, and they should make for some wonderful textures. What beads are you craving right now? It’s been a crazy week here with appointments, meetings, and a few pre-summer nature expeditions. 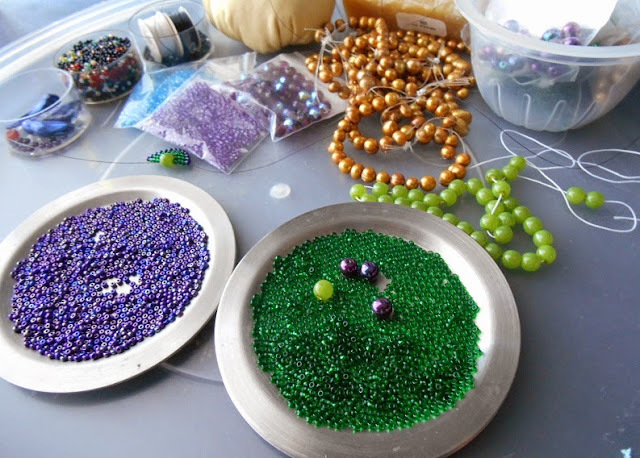 I’m a little behind on getting posts started for June, but I have managed to get in some beading time - and there are some exciting things happening on the bead tray right now. I can’t exactly show you the pieces that I’m working on this week, because they’re top secret, but I can share the colors. Most of the palettes are inspired by grapes and wine, which means some fun combinations of purples, greens, and maybe a little gold. There may even be an appearance by dusty blue freshwater pearls somewhere along the way. Last week’s rings all came out great. I experimented with tweaking my old design a bit and had great success. I also finally added cords to my most recent embroidery pendants, and they’re almost ready to join the others in the shop. Only 2 out of 4 necklaces got their photographs this week, as the battery in my new camera finally needed a recharge, but it’s a start. The bad news is, we haven't worked on a new embroidery pendant in some time, but that will hopefully be remedies this weekend.